I’ve never been interested in drawing anything from the real world. Frankly, I just never thought I would be any good at it. 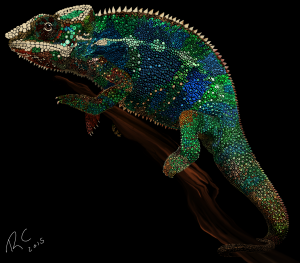 Though I still feel that way, obviously there are some exceptions because this chameleon turned out surprisingly well. I feel that all that incredibly detailed 8-bit Nintendo artwork I worked on over the past month or so was a great build up to this guy. He’s basically made up of a whole bunch of tiny colored dots, not unlike those retro Nintendo games. As for what I learned from this project, first and foremost is the fact that I feel way more confident in drawing something from real life based on just a photograph. I specifically picked this photograph because of how it was mostly made up of tiny dots. I was already able to visualize how I was able to going to approach this project, so that made it much easier to get started. If it was say, a picture of a wolf or something, I would have much more apprehension about whether I could pull it off. 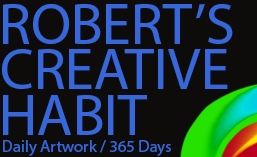 On top of that, I’m much more confident in going a little crazy with the color scheme. Although the shape and basic design of this digital painting is based on a real life high-quality photograph of a chameleon, I went ahead and changed some patterns and took chances with a few changes that ended up working out perfectly. So all-in-all, the number one take away is that I gained confidence in a few different ways by finishing this project and getting the result I wanted. They are, aren’t they? I have a new found appreciation for these iguanas.